Inline Static Mixers : plug-free mixing element generating merging vortices for uniform dispersion and mixing. The AZ Inline Static Mixer is a new and novel geometrical approach in boundary layer control for motionless mixing. The AZ mixing element configuration has two extended lobes. The cross-sectional area of the AZ mixing element is slightly less than the internal diameter of the tubing size. 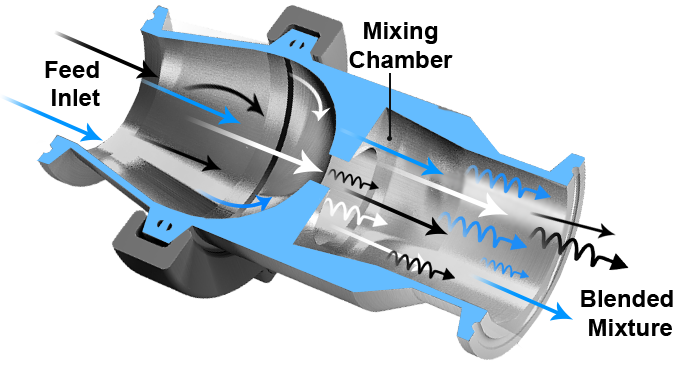 The large cross-sectional area will generate strong streamwise vortices with a minimum of pressure loss. The AZ Inline Static Mixer will accommodate variable flow rates without compromising the mixing effectiveness. In operation, the liquid or slurry entering the AZ mixing element is a smooth transition from laminar to turbulent flow. The flow stream is converted into an axial and radial flow pattern providing strong vortice structures. The radial flow issuing from the lobes will interact with the axial flow generating intense turbulence. The downstream vortices will overlap each other providing increased entrainment, uniform mixing and dispersion of two or more liquids in a short distance. The Model AZ series in Motionless Mixers without mixing element baffles that create back-pressure and plugging. Utilizing the pressurized energy in the production pipeline. Please contact our sales team to learn more about our AZ Inline Static Mixer and our Pilot Study Program. Please click on the corresponding link below to access a PDF file of our AZ Inline Static Mixer Performance Chart, sizes (1″) to (3″).